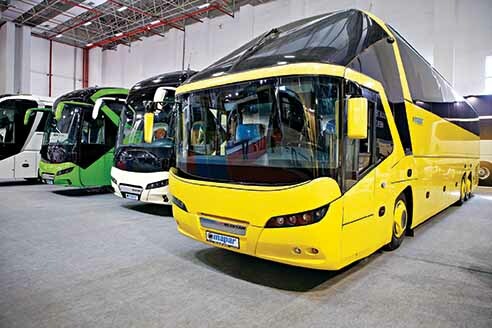 Held at Izmir Busworld Turkey highlighted safety and comfort through innovative solutions. 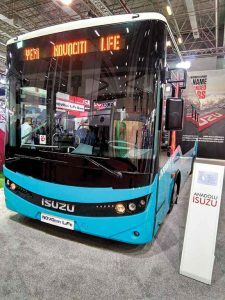 Shifting base to the port city of Izmir from Istanbul, the seventh edition of Busworld Turkey, held between April 19 and April 21, 2018, attracted over 10,040 professional visitors from 107 countries. Drawing the participation of 115 exhibitors from 18 countries, the premier event, held in a country known to export buses worth USD 1.15 billion as per the Turkish manufacturers trade organisation, opened its gates to the stakeholders of the bus industry from the region, and from various parts of the world, to provide them with a glimpse of the latest and most interesting. Occupying an area of 10,500 sq. m., the fair, organised by Busworld International in collaboration with its Turkish partner HKF Trade Fairs, was inaugurated by Izmir Mayor Aziz Kocaoğlu. Also present were TOF President Mustafa Yildrim, Head of transportation department of Eshot (Izmir public transport department) Hakan Uzun Ozet, Busworld International President Didier Ramoudt, and HKF Trade Fairs head Bekir Cakici. Held at the Fuar Izmir exhibition halls, Busworld Turkey 2018, on its second day saw the third edition of congress being conducted by the Busworld Academy. The theme, ‘Future of Bus Mobility’ focused on three segments – electromobility, safety and technology. 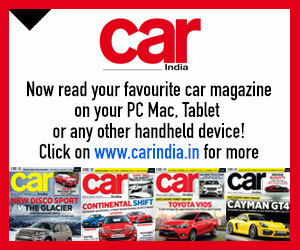 Also focusing on market trends, the congress saw presentations by domain experts about how zero emission buses are evolving; about passenger comfort and design, passenger safety, infotainment systems, mobility as a service, digitisation, market analysis, and various business models that could evolve as per the changing needs. With electromobility picking up, the seminar focused on procuring complicated systems along with infrastructure for charging equipment. With BMC, one of turkey’s biggest commercial vehicle manufacturers, booking the most space at 3000 sq.m., underlining the success of the show, it was Ramoudt who wisely commented that having the best buses and passenger transport can’t stay exclusive to any country. “The need is to create a safer and comfortable transport powered by clean energy buses in the state,” he mentioned. 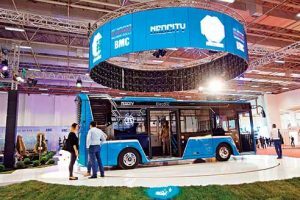 Displayed at BMC’s booth were a set of 10 m buses, including four world premier of EuroVI diesel bus, CNG and electric bus. The company presented an all-new 18 m helicopter bus powered by a natural gas or a diesel engine. The electric Neocity EV bus BMC displayed, drew a crowd. The highlight of the BMC booth was the 8.5 m Neocity ebus with monocoque body construction. Powered by 266 kWh lithium ion batteries, has a load carrying capacity of 10,400 kg. With the lithium ion batteries of the bus taking seven hours to fully charge, the bus can cover 210 km in city traffic and 275 km on the highway. It can accommodate 72 passengers (25 sitting and up to 51 standing). Flexing its muscles to underline the fact that it is a leading bus and coach manufacturer of Turkey, BMC showcased Neocity 8.5 m bus, a VIP Arpon 8.5 m bus, and a 10 m low floor bus. Other than the 14 m Arpon bus powered by a EuroVI compliant diesel engine, BMC showcased a 12 m EuroVI bus called Procity, a 9 m Neocity bus, and a 12 m low-floor EuroVI diesel and CNG powered Procity bus. 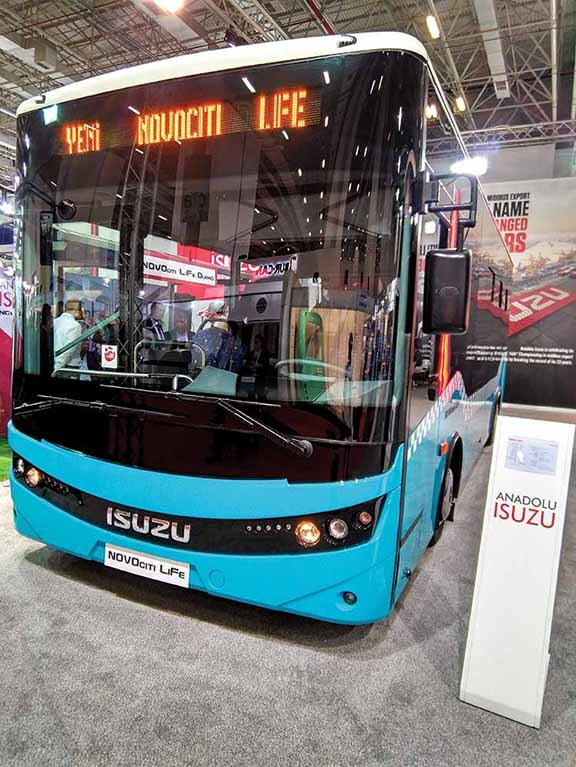 Unveiling a low floor midi-bus called Novociti Life, Anadolu Isuzu made its intention clear of expanding its reach to smaller cities. Capable of manoeuvring through narrow lanes, the eight-meter long Novociti Life could indeed open up a new market segment for Anadolu Isuzu. Powered by a FPT EuroVI emission compliant NEF4 engine located at the rear, the Novociti Life could be had with a ZF manual transmission or a Allison auto transmission. The 4.5-litre engine of the Novociti Life produces 183 hp and 680 Nm of peak torque. The bus can ferry up to 60 passengers. 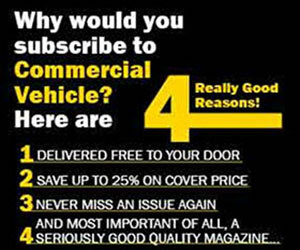 Expressed Anadolu Isuzu (Turkey) CEO, Tuğrul Arıkan, that the (Novociti Life) will offer cost advantages. “Anadolu Isuzu has already begun placing 80 Novociti Lifes at the disposal of Bingöl city as of April,” he quickly informed. 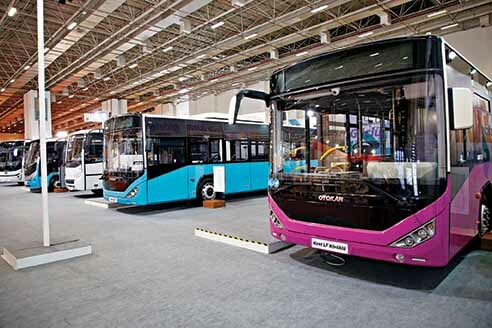 Representing MAN in Turkey, Mapar Otomotiv displayed many buses that it offers, and will offer, in Turkey. Two key models from the MAN portfolio Mapar Otomotiv showcased were the new Neoplan Tourliner and the Lion coach. the company has come to provide service in Istanbul with spare parts storage. 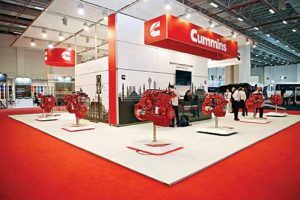 The company also has MAN Truck and Bus Trade Inc., in Bursa, and MAN Authorized Service in South Marmara Region and Izmir. Kent C articulated bus, Kent C, Sultan C, Sultan LF, Territo, Navigo and Poyraz bus. Bullish about achieving a growth of four and a half per cent in the small and mid-size bus segments while the industry average recorded a decline of almost 11.5 per cent, Otokar announced that it has won a tender for 400 city buses from Burcharest Municipality. Otokar also claimed that it has bagged a contract to supply 100 buses to Amman, the capital city of Jordan. 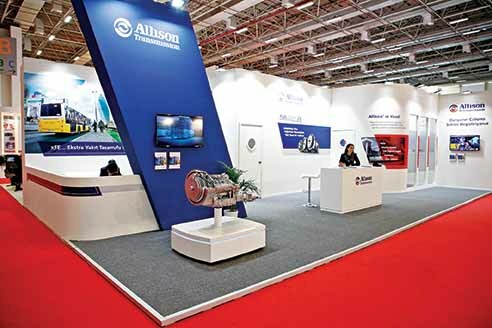 Highlighting the technology and the advantages offered by a fully automatic transmission, Allison Transmission displayed xFE models that have been designed to offer superior driving experience and comfort. Other than reducing the maintenance costs, xFE transmission models offer fuel savings of up to seven per cent. Allison also spoke about the 2000, 3000 and 4000 fully automatic transmissions, and about Fuel Sense 2.0 technology with DynActive Shifting that uses algorithm to efficiently shift based upon vehicle specifications and other factors. Cummins showcased an electric propulsion system for city, shuttle and inter-city bus applications. 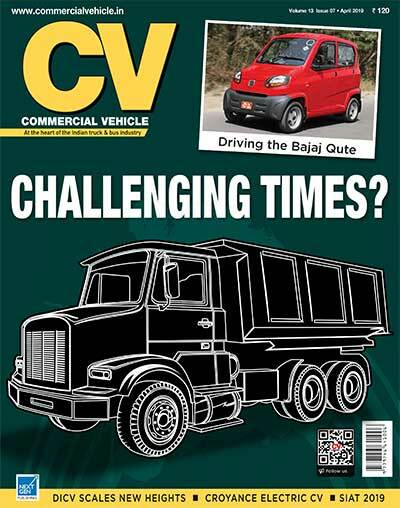 Standardised on a Cummins 74 kWh battery pack, the system is configurable either for a full battery electric vehicle (BEV), or a range extended electric vehicle (REEV), and incorporates an engine-generator to combine energy delivery with the battery pack. Capable of travelling 385 km on a single charge, the system is also configured with high-efficiency traction motor that provides direct drive with continuous, gearless acceleration and quiet operation. 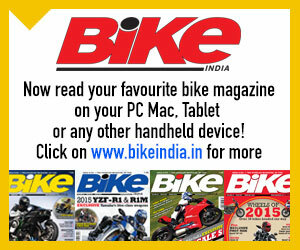 It also offers flexibility in operations with an integral plug-in connection for overnight or route end charging. 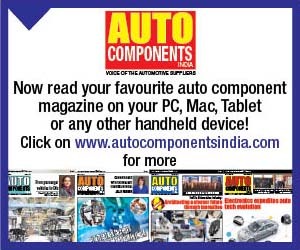 There is the option for on-route opportunity charging through a pantograph or charge plate infrastructure as well. The system provides a continuous electrical output of 215 kW (288 hp), increasing to a peak output of 350 kW (469 hp) whenever a power boost is required. ZF exhibited its CeTrax central drive unit AVE130 Electroportal and Openmatics intelligent connection solutions. ZF also displayed an eight-speed automatic transmission ‘PowerLine’ for the Turkish market. Designed for medium and heavy-duty trucks, PowerLine is compatible with LNG engine applications. It is claimed to offer five per cent fuel efficiency with a start-stop feature, and is ready to be used with Power Take-Off (PTO) and a retarder. The CeTrax by ZF is an electric drive unit that can be coupled with drive or portal axle and can find application in both existing powertrain configurations and vehicle concepts. Scheduled to go into series production later this year, CeTrax is capable of producing a maximum power of 300 kW and a peak torque of 4200 Nm torque, facilitating smooth travel for buses over difficult roads.